Academic Advising and Planning Center advisors recognize that we work with and serve a diverse group of students with diverse needs. Use this information to connect yourself to campus resources and information to aid in your decision-making. We know military and veteran students often have specific questions and concerns about their academic plan as they transition into college life. 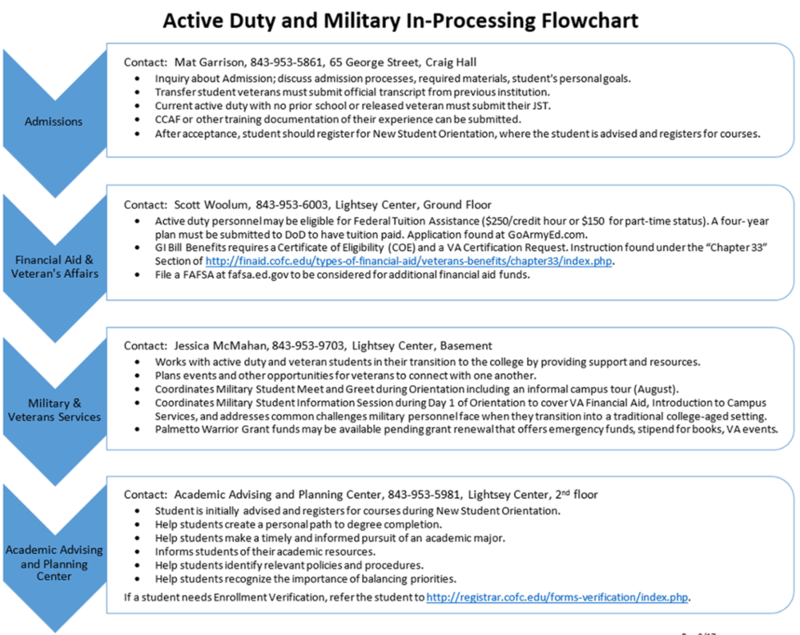 Reference the Active Duty and Military In-Processing Flowchart (PDF) to connect yourself to the appropriate person and key information to get started. The College of Charleston has services dedicated to serving students with a documented disability to ensure equal access at the College. It is important for students to begin the documentation process after you commit to enroll so that any related individualized accommodations can be communicated to you. Access information about the Center for Disability Services (SNAP) now to learn more details and additional resources. First Generation Students are defined as students with neither parent attending college. We know these students often need an additional layer of support. In addition to the advising services provided by our office, the College of Charleston partners with I’m First, “an online community celebrating first-generation college students and supporting those who will be". Learn more about programs and services at the College directed at supporting first generation students. Adult students have a unique set of circumstances. In most cases you may be balancing a family and a career alongside your desire to start or complete your degree. You are encouraged to think about how you can prioritize your education alongside your other responsibilities. Think about whether an in-class experience is a better setting for you or whether you should consider online course work. You must also think about the finances associated with attending the College of Charleston. Currently the College of Charleston does not offer academic credit for work experience. If you plan to start your degree, visit the Programs of Study at the College of Charleston to confirm we offer what you desire. Next, contact Admissions. If you plan to complete your degree and have taken courses elsewhere, visit our Transfer Student section. You may also want to consider our degree completion program, Bachelors of Professional Studies, which is featured in this article. If you plan to simply take some courses, visit the Non-Degree Programs information.